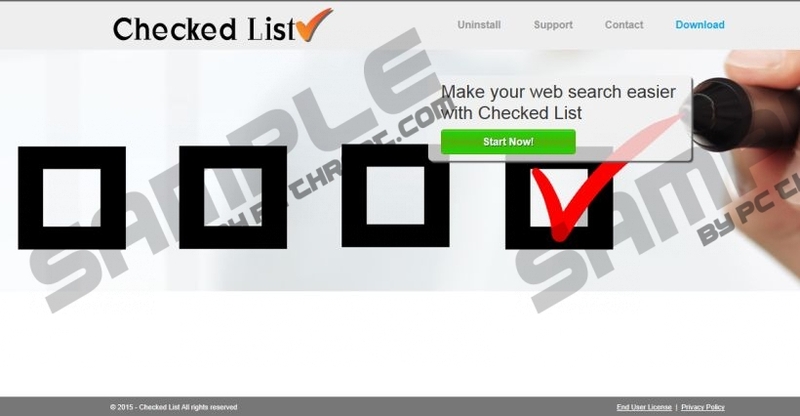 SuperWeb LLC has recently released a new adware app called Checked List. Our researchers were quick to take a look at it and were disappointed when they discovered that this infection is exactly like hundreds of previous releases. So, you should remove Checked List because, like its clones, it displays commercial advertisements provided by dubious third parties. The content promoted by Checked List can only be considered unreliable, because we have been receiving feedback from our readers who claim that they were unintentionally infected with this malware. So, make sure that you remove this infection in order to keep your computer malware free. For the most part, Checked List displays annoying pop-ups and coupons that are supplied largely by legitimate but low-grade advertisers. However, because the developers are open to do business with anyone who is interested, they are obliged to engage in business agreements with unreliable entities. Therefore, adware apps such as Checked List are likely to feature fake ads that could redirect you to infected websites, which in turn could infect your precious PC with undesirable Trojans, spyware, rogue programs, and so on. Note that some of these applications could be very difficult to remove for some anti-malware scanners, so make sure you have a reliable one protecting your computer at all times. As mentioned, Checked List has been developed by a company called SuperWeb. This company has been blamed for developing infections such as Flying Deals, Coupons Free, Ski Search, Coupon Time, and so on. All of these apps are basically old infections with a new face. Checked List is promoted at a website called Checkedlistapp.com. The website claims that it is dedicated to enhancing your browsing experience by providing you the best deals and prices. This is laughable, because this app does not have access to databases of any major retailer, or any small retailer, for that matter. All of their ads are provided by small-time advertisers. At any rate, Checked List is an application you should remove without hesitation, because it does not enhance your browsing experience in any way. The program only serves the interests of its developers and their clients. The application shows misleading and in some cases fake ads containing malicious programs that could jeopardize the security of your computer. Therefore, we recommend that you remove Checked List at your earliest convenience. Find Checked List and click Uninstall. Quick & tested solution for Checked List removal.